In case you haven’t noticed, we’re Virtual Reality enthusiasts at Filament Games, owed in no small part to the fact that the affordances of this emergent medium are so vast and varied. Virtual Reality is poised to change how we learn, or at least provide us with a new uniquely powerful modality towards that end. We can extrapolate that potential and posit that VR has incredible potential as a medium for impact, and indeed there is exciting work being done in this space. Nonprofits, researchers, and mission-based organizations around the world are exploring Virtual Reality as a means to accomplish serious objectives, whether that includes creating empathy, managing anxiety, or even facilitating physical therapy. Check out a few examples below of the innovative work being done to expand our understanding of VR as a medium. The Syrian Refugee Crisis is a defining phenomenon in our times, with many fiercely held beliefs about how to manage the exodus of Syrians, and where they might call home in the future. As that debate rages, many are doing what they can to make the experiences of these refugees real and tangible to people who are physically far-removed from the crucible of events that are causing the crisis. This is precisely the mission of 360Syria, a 360-degree video experience that can be viewed on Gear VR or the Oculus Rift. Viewers are situated at the center of the devastation, and can inhabit these spaces to see first-hand what it’s like to live in a war-torn, bombed-out urban environment. A quick internet search shows that 360Syria is one of many VR experiences that are designed to surface and embody the experience of the Syrian refugee – many activists are leveraging the power of this medium to create empathy. So what does it all mean? Taken in concert, these conclusions suggest that for some applications, VRET is nearly interchangeable with its real-world experiential counterparts. The implications are far-reaching: a soldier with PTSD could revisit the front lines from the safety of a therapist’s office. A traveler who needs to fly for work could overcome their fear of flying through repeated immersion without the corresponding repeated costs of plane tickets. With its ability to simulate nearly any experience, VRET makes many types of exposure therapy far more achievable and repeatable, which is a big win for patients. This chart shows a comparison between two distractive interventions, namely Nintendo and VR, and shows clear advantages for Virtual Reality. 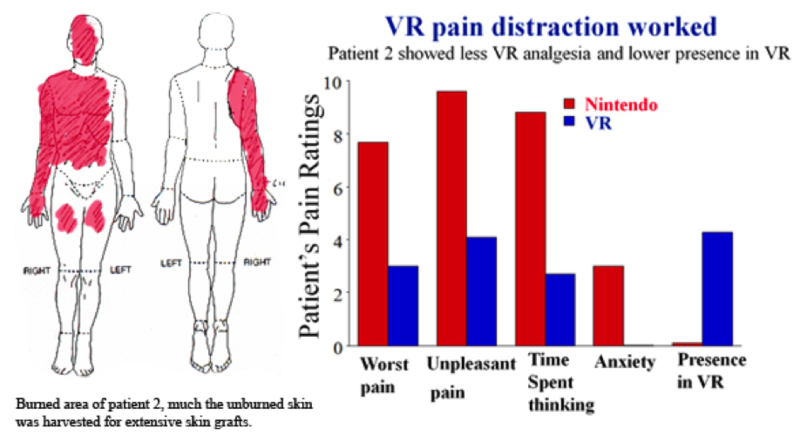 In fact, patients reported a reduction in pain from VR immersion that was more significant than the reduction in pain provided by morphine. With these kinds of bleeding edge applications, it’s easy to envision a future where the immersion and embodiment offered by Virtual Reality has a significant and wide-reaching impact on humanity and the way we think, feel, and even heal. Each of these projects is a demonstration of a mission-based organization leveraging the power of a new medium to create a real impact in the world, but we have a feeling this is just the beginning. What other serious applications can you envision for VR? We’d love to hear on Facebook or Twitter!